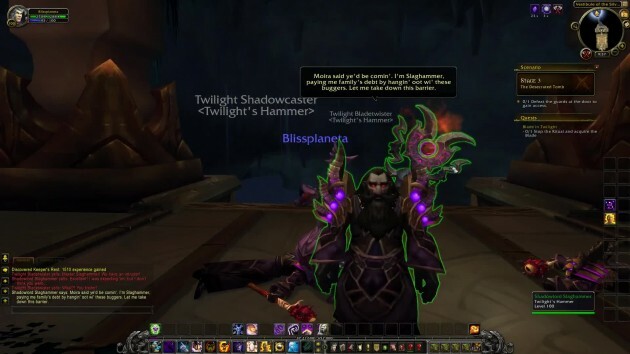 Alonsus Faol: I have been working with Moira Thaurissan on crushing the Twilight’s Hammer. 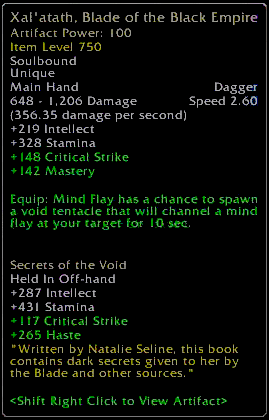 We’ve heard mention of a powerful Old god artifact, a blade, that occasionally surfaces to wreak havoc. Moira’s double agent has discovered a new leader is rising, and plans to cement their ascension using this weapon in an unholy ritual. I leave it to you to find him, stop the ritual, and take the artifact. We will meet you in Dalaran afterwards. Stop the ritual and acquire Xal’atath, Blade of the Black Empire. Alonsus Faol: The blade was taken to somewhere in northwestern Tirisfal. 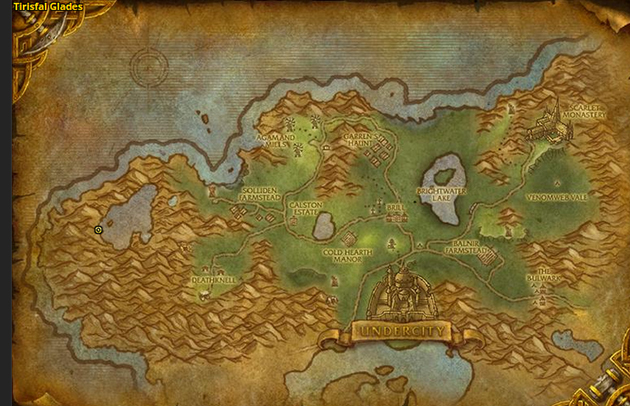 I’ve marked a location on your map where you can begin your search. STAGE 1: The Twilight Camp – The Twilight’s Hammer has set up a temporary camp up here. Investigate the camp for clues as to what is going on and where your ally is. Praise be to the new leader! Once the hand to the Twilight Father, the Shadow Deacon has decided now is the time to regain our past glory! 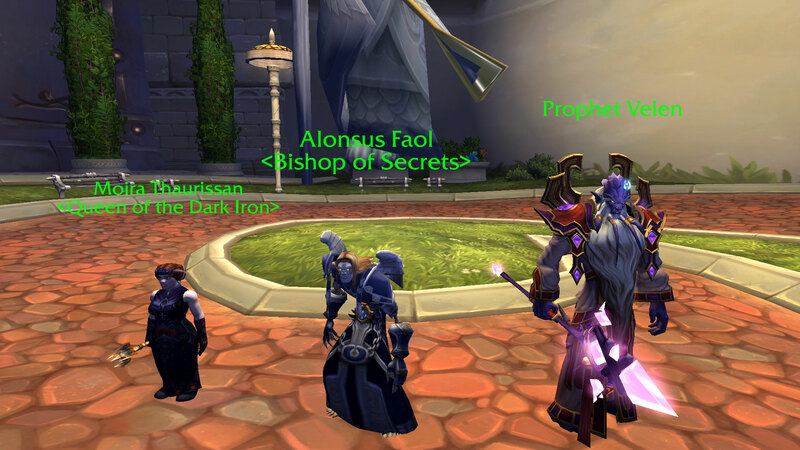 While the Twilight Father left to serve Deathwing, the Shadow Deacon maintained his “role” as a bishop in Stormwind. He continued infiltration and recruitment efforts there for some time until the fall of Deathwing and the Twilight Father. He then ordered what was left of our organization to go quiet and allow our foes their temporary victory. We have finished setting up a small base as per the Deacon’s orders. 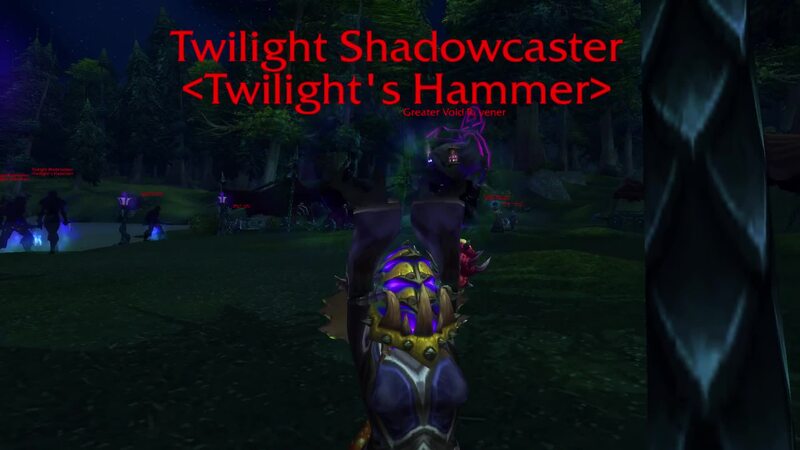 He is driven, so sure this is the proper path for the Twilight’s Hammer. We will be visible to our enemies but he believes it is worth the risk. There is some sort of broken seal leading to a complex beneath the lake. The lake itself looks like it suffered a titanic explosion thousands of years ago. Somehow the Shadow Deacon knew of this location and knows that a C’Thraxxi died here. His plan is bold. 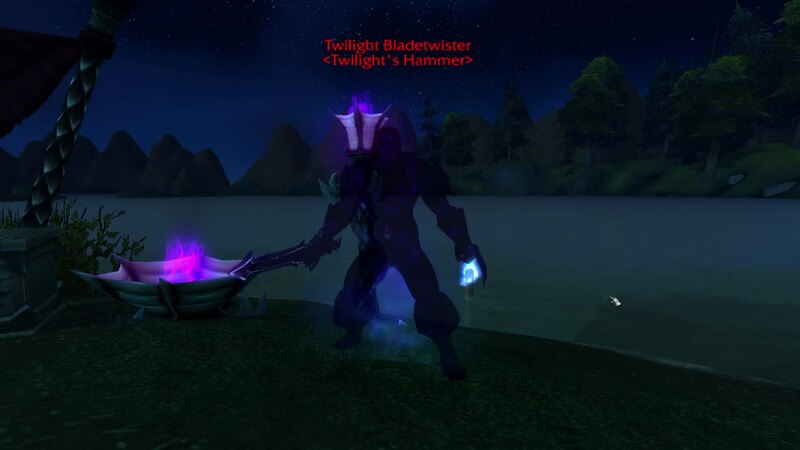 He will to use the Black Blade to resurrect this ancient being and restore the Twilight’s Hammer to its pinnacle. Tomorrow I go in to command the forces holding the upper area. He has already dampened the wards and is preparing to enter the lower area. The Shadow Deacon was a cautious and calculating master, preferring the secrecy of the shadows to direct action. 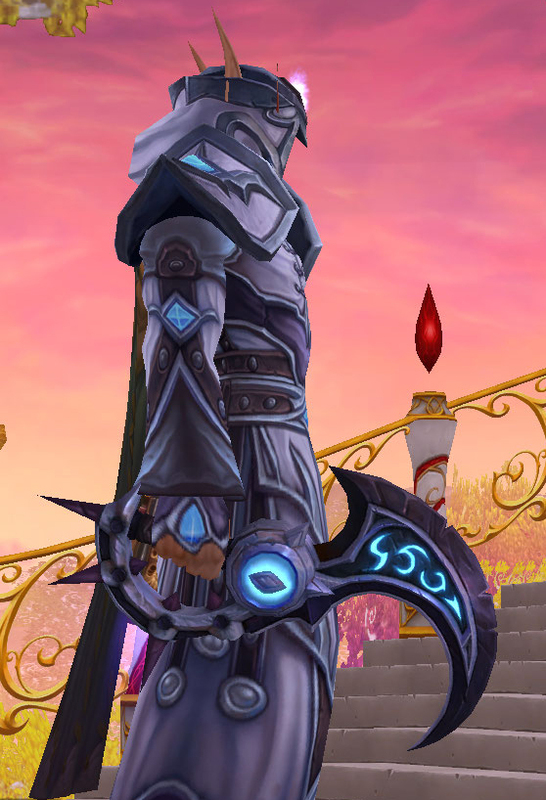 Ever since he found the Blade, his entire demanor has changed. Arrogant, commanding, audacious. 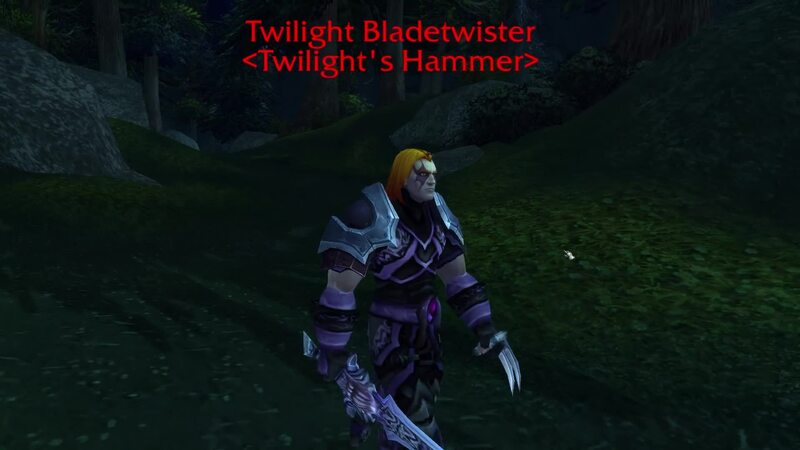 He now favors a bold plan to restore power to the Twilight’s Hammer. 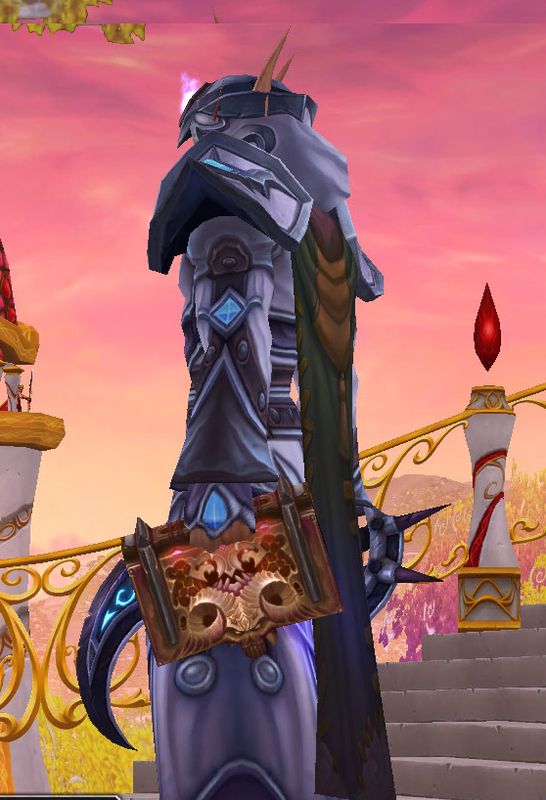 The Blade is called Xala’tath. It has come from age before most of our races existed. We only have the scrawlings of previous holders to go from. While it is mostly ravings of those that lacked the will to wield the Blade, many of them say the same things. 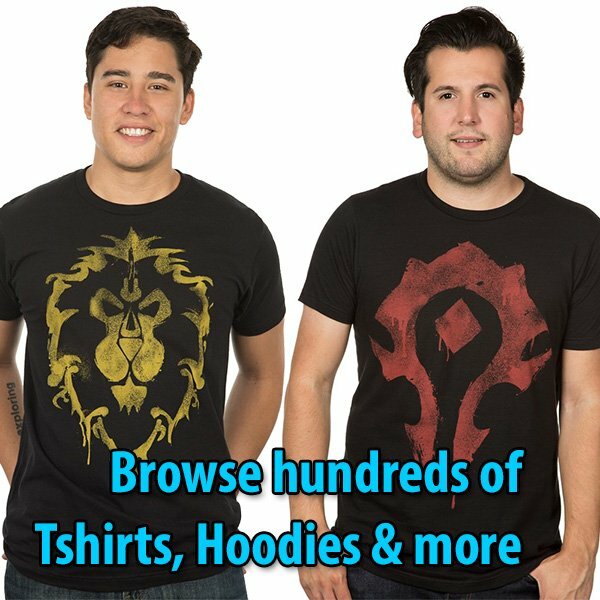 They speak of the Black Empire, of a time when our true masters ruled all of Azeroth. Massive sacrifices, living buildings filled with void energies. Sometimes we can hear the Shadow Deacon speaking to … someone in his tent. He has mentioned the glory of the Black Empire as well. STAGE 2: Raiding the Tomb Raiders – The cultists have entered a tomb complex at the bottom of the lake. The ritual must be happening in there. Note: Move to the lake in front of where the Void Walker was. 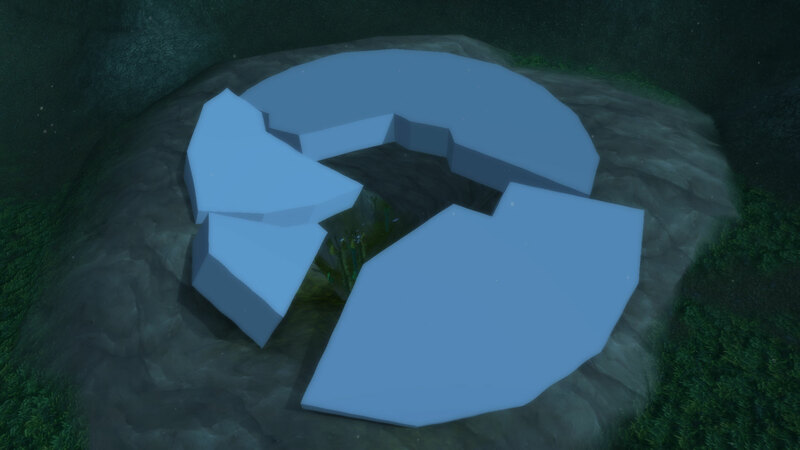 There is a broken white stone on the bottom of the lake. It’s a cave. 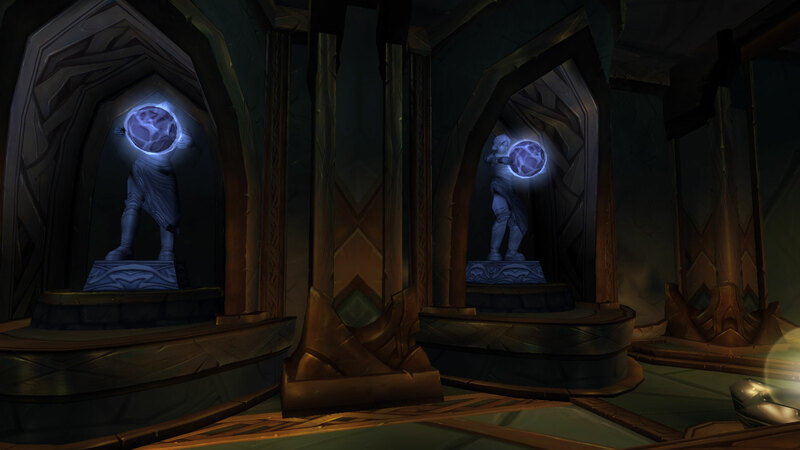 Location: Vestibule of the Silver Hand. STAGE 3: The Desecrated Tomb – The cultists have breached the tomb of an ancient titan keeper! Slay the guards and open the way into the complex. Twilight Bladetwister: Master Slaghammer! We have an intruder! Twilight Bladetwister: What?! You traitor! Shadowlord Slaghammer: Moira said ye’d be comin’. I’m Slaghammer, paying me family’s debt by hangin’ oot wi’ these buggers. let me take down this barrier. The Shadow Deacon is already below starting his ritual. Ta get there we’ll need ta do some work first next door. If ye have any questions let me know, but we must hurry! Shadowlord Slaghammer: We dinna hae much time, but ye deserve some answers. What ye want to know about? The Shadow Deacon? The Blade? What the hell is going on? Hah! Shadowlord Slaghammer: Can ye believe they found the Tomb of Tyr himself?! He died here LONG ago fighting some monstruous general of the Old gods. His comrades buried him ‘ere and the corpse o’ that beast further in. This tomb was also meant to guard the prison tomb o’ that monster but the Twilight’s Hammer put a stop ta that. 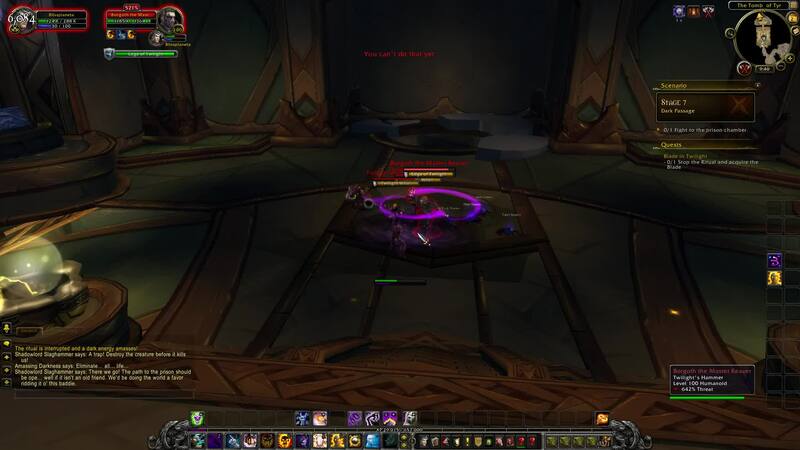 The Shadow Deacon used that blade o’ his ta get in and his minions to keep the wards down while he went below. Shadowlord Slaghammer: The Hammer has been in disarray since their Twilight Father and Deathwing took a dive. I’m guessin’ tha when the Legion attacked one o’ the leaders that was left took to the idea of takin’ over while everyone was distracted. 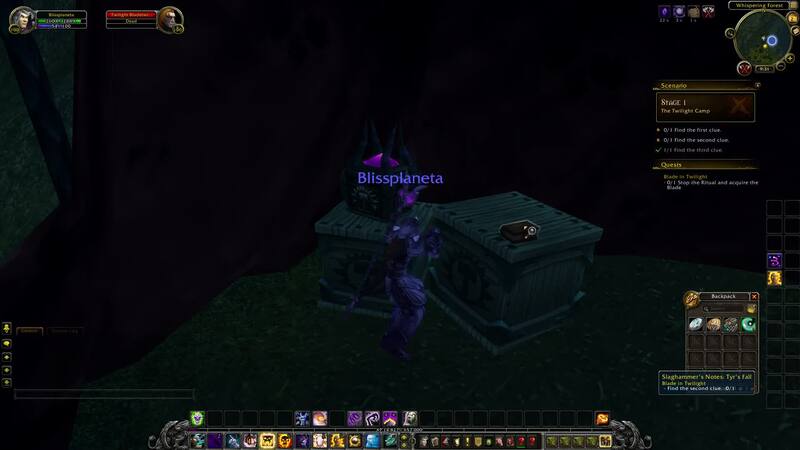 He dredged up an ancient artifact o’ the Old gods and is planning on using it on that dead monstrosity down there to cement his takeover o’ the cult. Shadowlord Slaghammer: That blade… I knew Moira would want ta know. 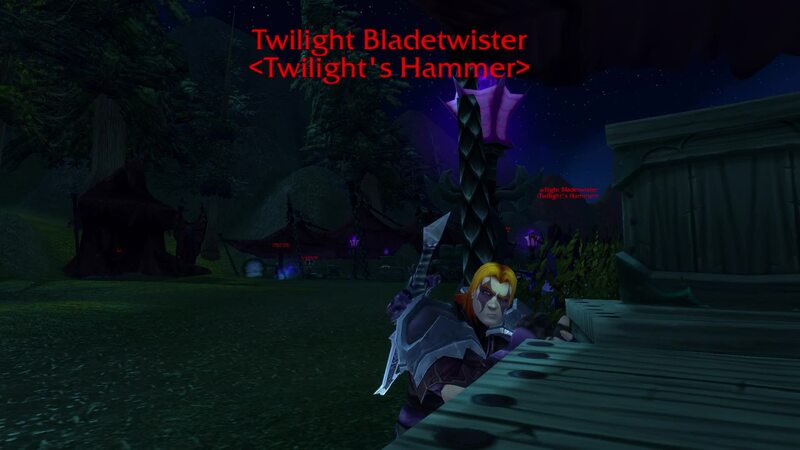 I think that dagger has been behind some of the worst nightmares Azeroth has seen if I remember me stories. It looks similar ta stories told about the War o’ Three Hammers… and Grim Batol. It oozes shadow and seems ta cut the verra light! I think it might have a mind of its own too. It seems the Shadow Deacon is sometimes talkin’ and arguing, but to nobody at all! We’d best stop this ritual and pry that blade loose o’ the cult. 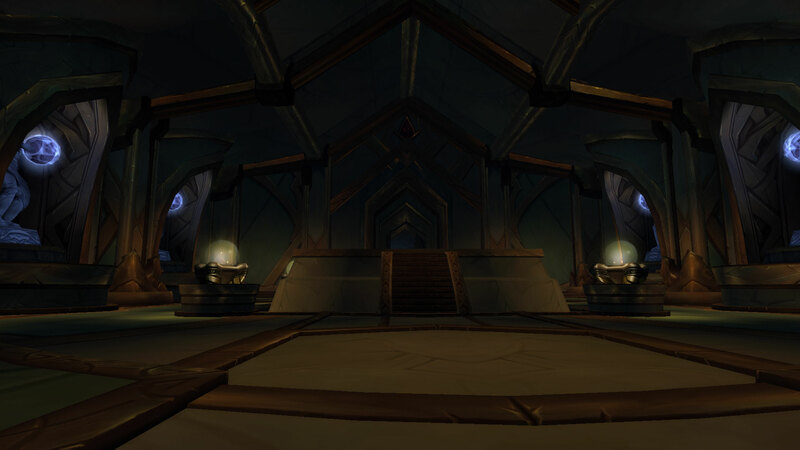 STAGE 4: The Tomb of Tyr – Slaghammer wants to get further into the complex, but cultists bar the way in the next room. Enter the tomb room and deal with them. STAGE 5: Reconsecration – Cultists are dampening the holy wards of the tomb. Dispel their defenses and kill the ritualists to break the barrier. Shadowlord Slaghammer: So these buggers are keeping Tyr’s wards down so the Deacon can do his work below. We’ll need ta take ’em down ta slow things down and move past. The ritualists have powerful wards themselves, so dinnae ferget to dispel ’em! Note: In the video I didn’t read, but Slaghammer did say you have to dispel them to remove their shield buff. 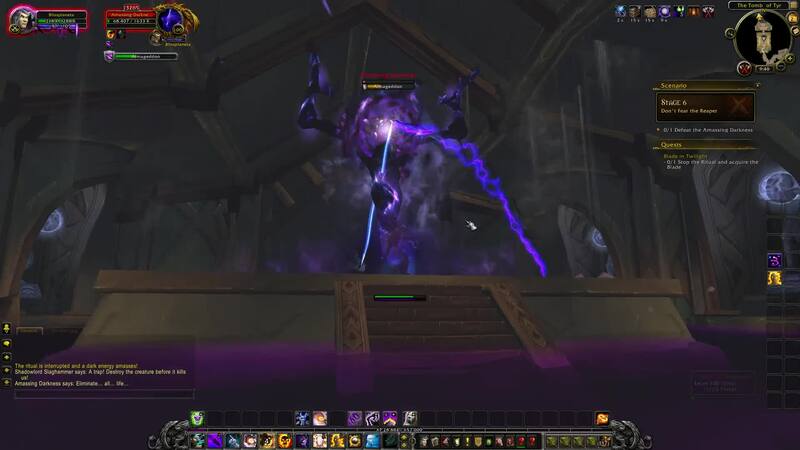 STAGE 6: Don’t Fear the Reaper – The ritual has been thwarted but void energy remains! Defeat it! (The ritual is interrupted and a dark energy amasses! Shadowlord Slaghammer: A trap! Destroy the creature before it kills us! Shadowlord Slaghammer: There we go! The path to the prison should be ope…well if it isn’t an old friend. We’d be doing the world a favor ridding it o’ this baddie. STAGE 7: Dark Passage – The way is open to the prison. Continue down the unsealed passage to whatever waits below. Note: There are three mobs here. They have a long-range aggro range so make sure to prepare. All come together. Borgoth the Master Reaver and two Twilight Bladetwister. As you can see in the video I got into trouble really quick and ran away to no avail. They won’t break aggro until they are dead or you are. Not a great idea to swim away as you get slowed down. Run around the room instead. They have a cleave that can be seen as a purple effect, and the worst one is when they make a stance and start a visible purple whirlwind that does loads of damage. You should move away and keep doing damage to them while they are in whirlwind mode. Sorry for the running for my life in the video hehe. 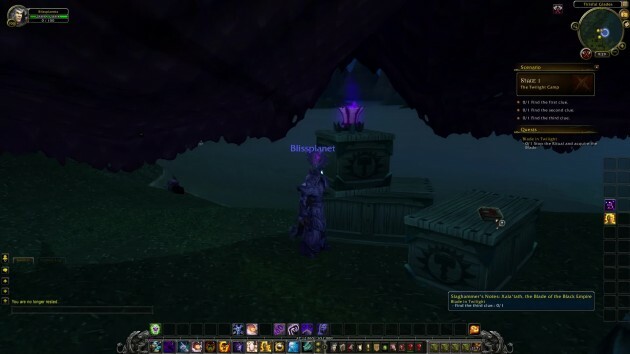 Haven’t played a shadow priest in years. Skip the video from 19:30 until 26:00. Use Mind Sear against the bunch of tentacles at The Darkwalk area. Farthing: The Blade is right, I am unstoppable! Once we resurrect Zakajz I will hold dominion over this world! Farthing: Our old leaders chose pawns to work with. I choose the REAL power! STAGE 8: Death to the Deacon – The Twilight Deacon is trying to bring the killer of Tyr back to life! Stop him! Note: This is Grave-Prison of Zakajz. Be very careful here. There is a large gap with a fallen pillar as bridge. You can fall and die. If you fall, you get rezzed near this narrow bridge. Tip: Kill both Faceless Guardians one at a time. When you engage the boss, he will summon to shadow copies of himself. Dot the shadow copies, and cast Mind Sear until the shadow copies disappear, then hit the boss hard. Eventually he will summon many void tendrils. Stay out of range by the bridge and they won’t shoot. Shadow Slaghammer: This is nae good. I ken hear more coming from above. Ah’ll handle them, you take care o’ the Deacon! Twilight Deacon Farthing: Defend me! You said this would work! Twilight Deacon Farthing: You think to stop me? With this blade I can do anything! ANYTHING! Twilight Deacon Farthing: You cannot trust your own mind! 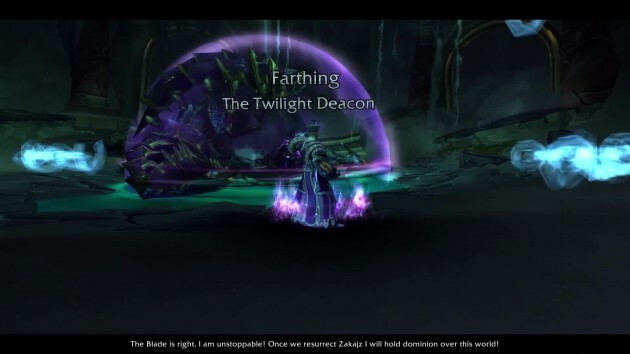 Twilight Deacon Farthing: See how I bend your mind to my will! 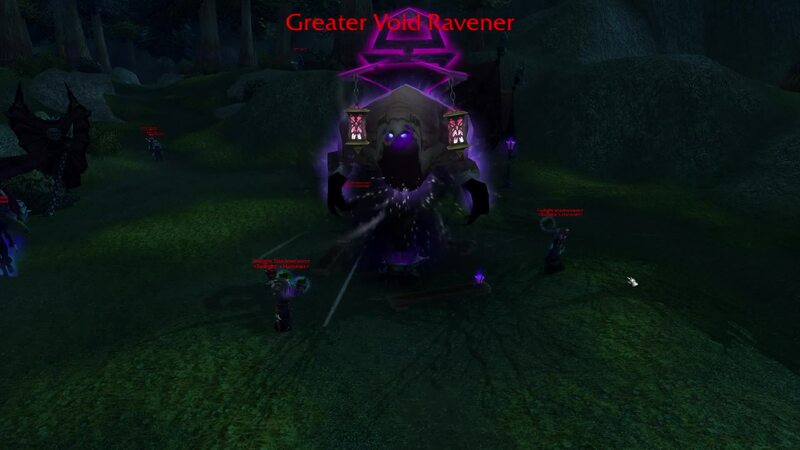 Tip: When he says the darkness consumes all, he summons more void tendrils. Move away past the bridge toward the entrance to stay out of range. Twilight Deacon Farthing: The darkness consumes all! Twilight Deacon Farthing: This shouldn’t be happening, why aren’t you protecting me?! 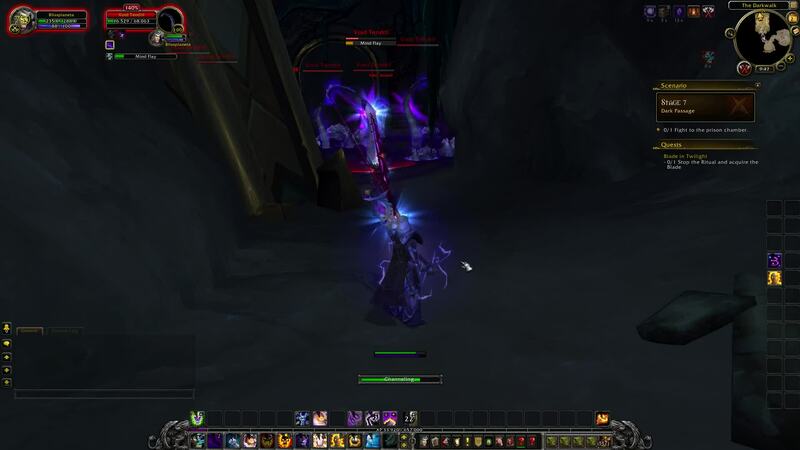 Xal’atath, Blade of the Black Empire: Weak and pitiful. The Twilight Father did not use me because he knew the price of failure. Twilight Deacon Farthing: Give me another chance! No! Noooo! 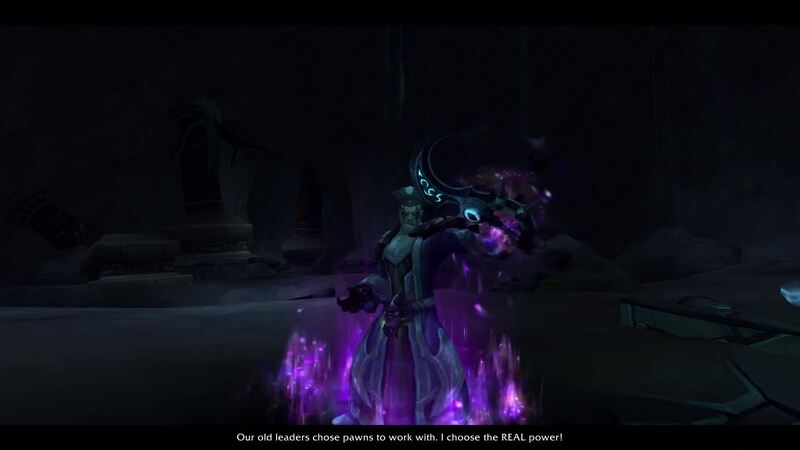 Xal’atath, Blade of the Black Empire: You on the other hand, we could do great things together. Take me up, and I will help you… for now. STAGE 9: The Blade of the Black Empire – With the Deacon dead the blade is now yours. Take it. FINAL STAGE: The True Death of Zakajz – The C’Thraxxi general could still be a threat in the future. The Blade must be used to drain all of its essence so Zakajz will be truly dead. Xal’atath, Blade of the Black Empire: Yes, we are eager to feast on the fallen titan’s minions. But first Zakajz. Xal’atath, Blade of the Black Empire: The cultists may return, or he may awaken far into the future. We must consume his energy. After that, he will be gone forever. You know this must be done. Note: Click the Dark Drain icon that appears onscreen near Zakajz’s corpse. Shadowlord Slaghammer: Ya did it! The cultists hae run off, ha ha! You should get back ta Faol, ah’ll use this Twilight portal stone fer ya! Note: Click the Portal to Dalaran City. It looks like a rectangular shadow portal. Shadowlord Slaghammer: You keep an eye on that blade though. No tellin’ wha something that old is capable of. 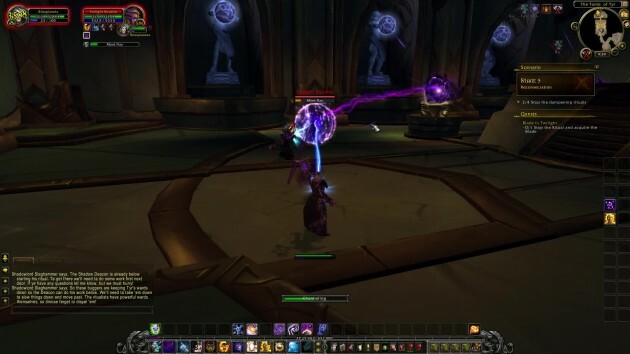 Tip: Alonsus Faol is now at the statue of Archmage Antonidas. 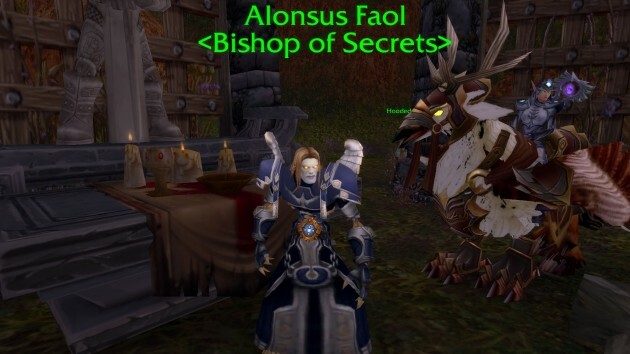 Alonsus Faol awaits you along with Prophet Velen and Moira Thaurissan. Alonsus Faol: Ah (name) has returned with total success! Moira Thaurissan: He shows talent. Prophet Velen: Well done indeed. 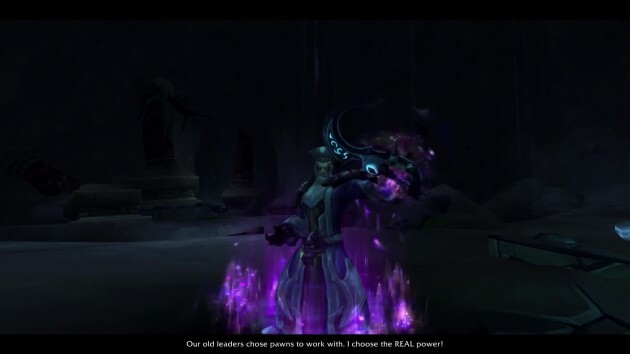 You have proven to be a powerful priest. Moira Thaurissan: You have no small amount of skill for these sort of tasks. That is good, we will need more from you to survive this conflict. Alonsus Faol: With that we are in agreement. If you would speak with Velen, he has a… unique situation for you. Note: Skip the video from 19:30 until 26:00.